120 Days Same as Cash $312.00- Save Big. This is where streaming boxes are headed, and we are out front with the 4K box. Custom-built user interface ensures ease of use. StreamSmart even updates your box periodically so you are always on the leading edge of the streaming dimension! This box includes your Lifetime Membership to ChannelUp (worth $79.95), which gives you access to over 100 HD streaming channels!! Streamsmart Pro – Top of the Line! Streamsmart Pro is the flagship, top of the line box! »Supports video formats: VC-1, H.264, MPEG-1, MPEG-2, MPEG-4, DIVX, RM, etc. »Supports audio formats: MP3, WMA, AC3, DTS, AAC, FLAC, etc. StreamSmart boxes essentially make the entire internet your personal DVR. 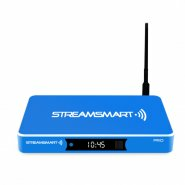 If the content is hosted on the internet anywhere, the StreamSmart box will likely have access to it. This means you can watch what you want, when you want… all without commercials. StreamSmart boxes also give you access to live tv broadcasts… it may not be your local area, but it will be network tv. You only pay one-time with StreamSmart. Reduce or eliminate your monthly cable or satellite costs. Which would you rather pay? Month after month for cable or satellite? Keep that money in your wallet with StreamSmart! Get potential savings of $1,126 the first year! StreamSmart Pro boxes allow you to take control of your entertainment costs. Whether you are just looking to supplement your current cable/satellite situation, or if you are looking to completely cut the cord, a StreamSmart box can help you reach that goal. And by the way, the box is portable! You can use it anywhere – at home or on the road! Apple and Roku can’t do that! We have negotiated agreements with these Channel Providers, so you do not have to pay subscription fees. We will be adding to this list, creating more value for you as a StreamSmart TV box owner. We will continue to work for you to bring quality channel partners and addons. When we add a new channel partner, it will be loaded into your box automatically. Customers that have registered their StreamSmart box will receive an email update with details.